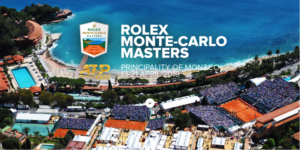 Exciting Rolex Monte-Carlo Masters – Art, Food, Travel and Fashion! The Monte-Carlo Masters is an annual tennis tournament for male professional players held in Roquebrune-Cap-Martin, France, a commune that borders on Monaco. The event is part of the ATP World Tour Masters 1000on the Association of Tennis Professionals (ATP) Tour. The tournament is played on clay courts and is held every year in the April–May period. The Rolex Monte Carlo Masters has been one of the most prestigious events in the world of international tennis for over 100 years. Since 2000, the Monte Carlo Tournament has been part of an elite ATP Championship: Masters Series. The best world tennis players meet on the courts of the Monte-Carlo Country Club. Over the years the competition was won by such talented players as Gustavo Kuerten, Cedric Pioline, Andrei Chesnokov, Juan Carlos Ferrero, Guillermo Coria, Ivan Lendl, Novak Djokovic and the unrivalled Rafael Nadal who won the tournament 8 times in a row from 2005 to 2012, a record in the world of tennis!